The Thomas Dee family built the Gray Cliff Lodge in 1912 to serve as their summer home. It was named for the gray cliffs, a hallmark of Ogden Canyon, behind the structure. In 1932, the home was sold to Ed and Toby Greenwell, who used it as a boarding house and began hosting dinner parties in the main common room – the dining room today. 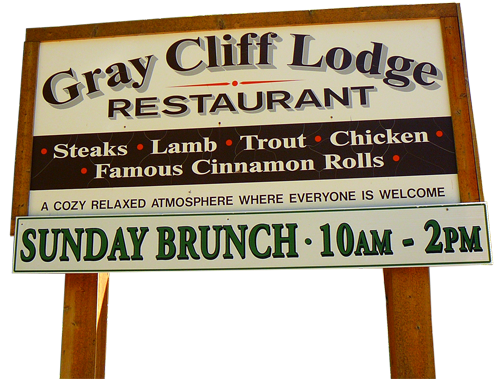 By 1945, the Gray Cliff Lodge was a full-time restaurant. In 1965, Neal and Lois Sniggs bought the restaurant; their son and daughter-in-law, Stephen and Jody Sniggs, bought it in 1979 and are the current owners. Stephen Sniggs said he grew up around his father’s restaurant business and began washing dishes when he was 12. Since then, he has spent more than three decades perfecting his recipes in the kitchen. Jody Sniggs runs the front end of the business. Patrons are welcomed by and enclosed porch furnished with rocking chairs and wind chimes. Once inside, a cozy dining room set with tablecloths and fine china invites guests to sit by the warm glow of the fireplace. The most popular dish is the Fresh Mountain Trout using local trout. “We try to keep everything as fresh and local as possible,” Stephen Sniggs said. All meals are served with a fruit cup or tomato juice, green salad or homemade soup, potato or rice, fresh baked dinner rolls and cinnamon rolls, and a homemade dessert. Other specialties include Slow Roasted Prime Rib, Grilled Lamb Chops, T-Bone Steak and Fried Chicken. Pan Fried Oysters, Fried Mushrooms or Zucchini and Pan Fried Chicken Livers are popular appetizers. The chicken livers are a rare treat according to Stephen Sniggs. “I have people who come from all over the world to eat my chicken livers. Not too many places cook them any more, ” he said. Homemade soups include chicken gumbo, black bean and rice, and squash bisque. Desserts are also made from scratch and usually go with what is in season, such as peach pie in September and pumpkin pie in October and November. The Sniggs also offer the house specialty, Oatmeal pie along with Brownie pie, Carrot cake, Bread pudding and dairy fresh Farr’s Ice Cream. Plenty of regulars eat at the Gray Cliff Lodge, including a couple who celebrated their 55th wedding anniversary there –the same place they had their wedding luncheon. The Gray Cliff Lodge Restaurant is a beautiful location for a perfect dinner, providing a cozy, relaxed atmosphere for you and your guests.